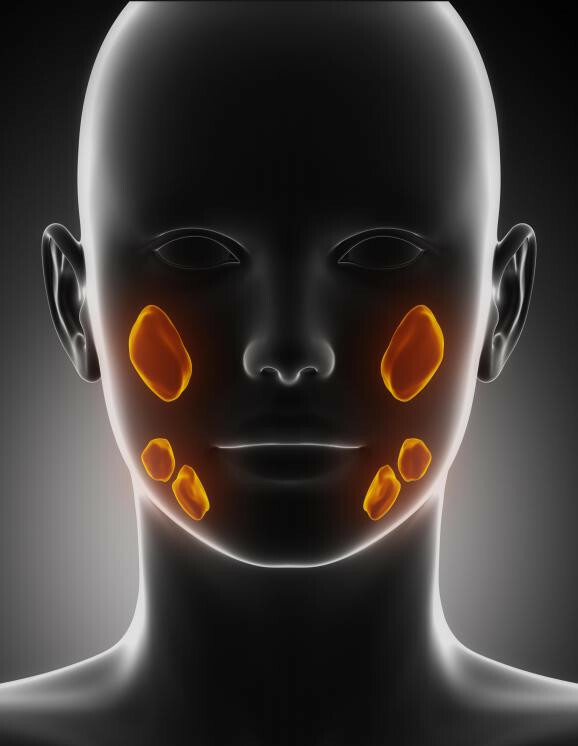 The salivary glands purpose is to excrete saliva to aid in the breakdown of food. The major glands are located on the floor of your mouth and just in front of your ears, and there are other minor glands in your tongue, cheeks, and lips. Sometimes these salivary glands can become infected by a virus or bacteria. This infection and inflammation is called sialadenitis. At times, this infection can become severe, causing an abscess, which is a pocket filled with pus. Treatment generally includes antibiotics, plenty of fluids, and in more severe cases, surgical drainage. The salivary glands make saliva, which is an important part of digestion. Saliva contains enzymes that start the chemical breakdown of food while in the mouth. It also lubricates the food so it can easily pass down the esophagus. Short tubes called ducts bring the saliva into the mouth from the glands that are located in pairs along the floor of the mouth (submandibular glands), just in front of the ears (parotid glands), and on the underside of the tongue (sublingual glands). The saliva from the parotid glands are transported through ducts in the cheeks. The glands continuously produce saliva to help keep your mouth moist, but much more is produced when you eat. What Is Salivary Gland Infection? When bacteria or a virus invades the salivary glands it causes an infection called sialadenitis, which also produces pain and inflammation. It can sometimes be caused by a blockage or inflammation of a salivary duct or reduced saliva flow. This reduced flow can prevent enough saliva from washing away food particles and the bacteria that is always present in our mouths, leading to infection. Besides aiding in digestion, it is the job of the salivary glands to help keep our mouths clean. When the largest of these glands, the parotid glands located in front of the ears just above the jaw, become infected, this is called parotitis. There are hundreds of smaller glands and ducts located throughout your mouth that can also become inflamed and infected due to reduced saliva flow. This reduced saliva flow is typically seen in people with chronic illness or in the elderly. What Are the Symptoms and Complications of a Salivary Gland Infection? There are a number of symptoms of a salivary gland infection. The most common symptoms are pain and swelling in and around the gland and the mouth. Anything that stimulates the salivary glands like eating or even the thought of eating can lead to the gland becoming swollen and causing pain. Swelling can also occur even without an infection or inflammation which can be caused by a partial blockage of the ducts. Sometimes the infection can be severe and cause a pus-filled abscess that will usually need to be drained. You should seek immediate medical attention if you have problems swallowing, are running a high fever, or are having difficulty breathing. What Are the Causes of a Salivary Gland Infection? What Are the Treatments for Salivary Gland Infection? Treatment for a salivary gland infection will depend on the cause (viral or bacterial) and the severity of the infection and symptoms. Viral infections will generally clear up on their own with some self-care. Getting plenty of rest, treating the fever and pain with over-the-counter medications, and staying hydrated are usually enough to get you through. If there is severe dehydration the doctor may administer intravenous fluids to prevent further complications. A viral infection will usually clear up within ten days. The most common treatment for a bacterial infection is antibiotics and plenty of fluids. In some cases over-the-counter pain medications can be taken, hot compresses are used for swelling, and salt-water rinses are used to keep the mouth clean. If there is a blockage in the duct due to a stone, it may need surgical removal. An abscess will typically need to be drained by your doctor. The infection will start to clear up in a few days after starting antibiotics.